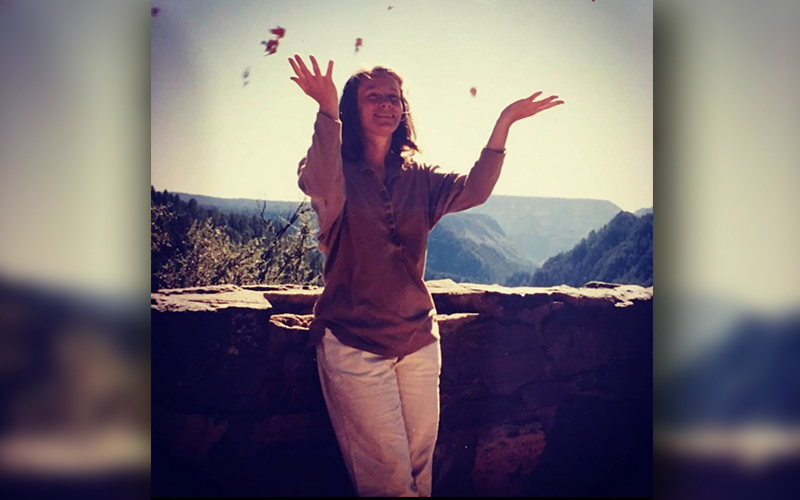 MESA – Debra Hartin’s family remembers a woman who lived her life fiercely, with few limits. She rowed canoes in the Minnesota wilderness, her clothes drenched from rain. She swam in a triathlon, sharing the running and biking with her sister and niece. She hiked trails in Usery Mountain Regional Park — her favorite park in the Valley. The adventures stopped one day in May, when the 58-year-old fell while mountain biking in Arizona. A blood clot formed in her leg. She died after surgery in July. 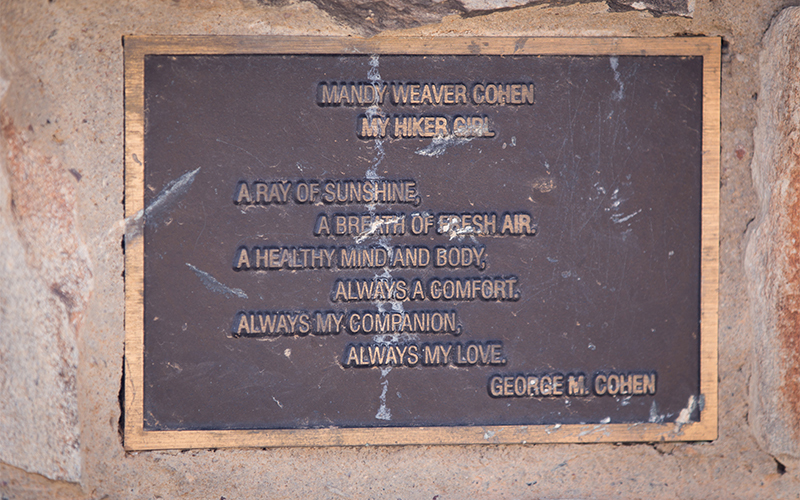 Three days after her funeral, a few family members hiked along the Wind Cave trail at Usery. They saw benches, built of stone or hard plastic, engraved with words memorializing deceased loved ones. There, they shared an idea: We need a bench for Debra. Memorial benches offer respite for hikers at parks throughout the Phoenix metro area. Maricopa County Parks and Recreation offers them at regional mountain parks, like Usery Park in the southeast Valley and White Tank Mountain Regional Park in the West Valley. Some cities, including Phoenix and Scottsdale, have benches but have stopped the program, according to their websites. The benches, made of stone or hardened plastic, are marked with a memorial plaque to reflect a loved one’s spirit and the person’s relationship with nature, said Dan Harris, park supervisor at Estrella Mountain Park. Some are recent, and others are from long ago. All came to be after someone who loved them left something behind in their name. 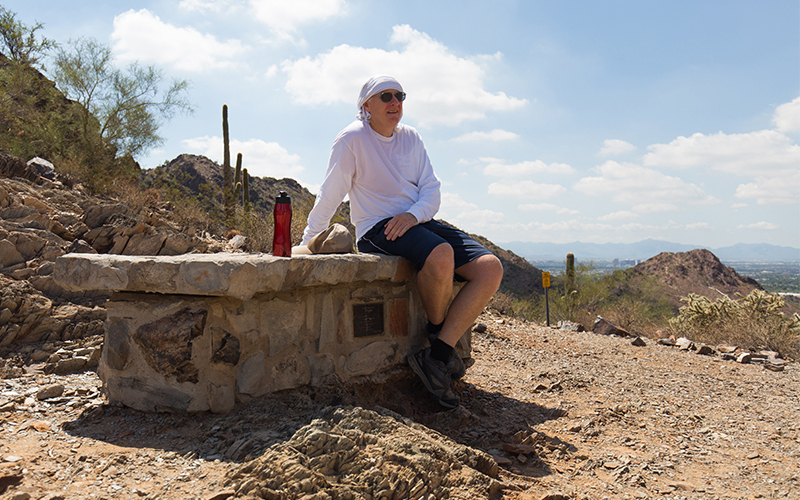 Stephen Nally, a Scottsdale resident, caught his breath at a memorial bench along the Nature trail on a September morning at Piestewa Peak, part of the Phoenix Mountains Preserve. – Sherrie Hartin-King, Debra Hartin’s niece. There are no apparent Arizona regulations or official county standards to limit the number or placement of benches. Park supervisors decide where to place a bench so it has little environmental impact on the desert, said Dawna Taylor, spokeswoman for the county parks department. Maricopa County Parks and Recreation Department. Park supervisors try not to overpopulate trails with benches, Taylor said. If a supervisor feels a trail has exceeded its number of benches, environmental impact being the standard, he or she will work hard to find a different location. “Before trails are developed, an environmental assessment is completed to ensure the trail doesn’t disrupt any cultural or natural resources,” she said. Park supervisors have the final say but do their best to avoid removing cactus or plants, she said. There have been instances where sage bushes and grass have been removed, said Harris, supervisor at Estrella Mountain Park. Cities that had memorial programs for recreation areas, such as Scottsdale and Phoenix, also set their own policy. But Phoenix officials decided there can be too many memorial benches and discontinued the installation of trail benches 12 years ago because they were overrun with requests, said Rick Plautz, a former Phoenix park supervisor who now works with the county parks system. “It’s an effort to maintain the natural beauty of the preserves,” Phoenix Parks and Recreation spokesman Gregg Bach said in an email. Scottsdale officials discontinued its Tree and Memorial Bench Program in December 2015, according to their website. Arizona State Parks don’t have an official program like Maricopa County, said Glenn Schlottman, chief of marketing, although they have placed benches on a “per park basis.” He said the park manager and development team will construct benches based on who it’s dedicated to, the materials proposed for a memorial and how it relates to the park. The state plans to build a memorial park dedicated to the 19 Granite Mountain Hotshots who died June 28, 2013 in the Yarnell Hill Fire. – Kathy Danger, Debra Hartin’s sister. 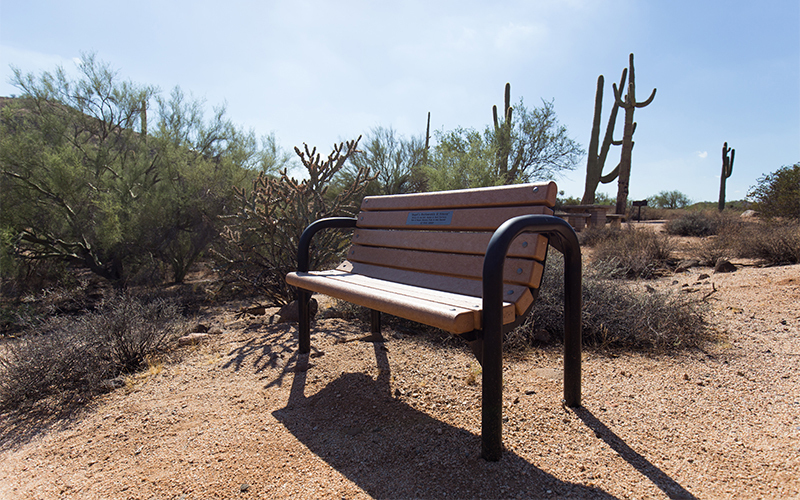 People can apply for a memorial bench directly at a Maricopa County regional park or print the online version of the application and mail it in. Most applications are approved if space is available in a park, said Dan Wilson, park supervisor at Usery Mountain Regional Park. The park supervisor and purchaser must agree on a location. A private company takes about three months to build a bench, which costs about $900 and is made of recycled plastic and steel pipes or stone. Other memorial options are picnic tables and ramadas.